Hobart Doll Club members love dolls! Our members love to make or collect porcelain dolls and we meet regularly throughout the year. 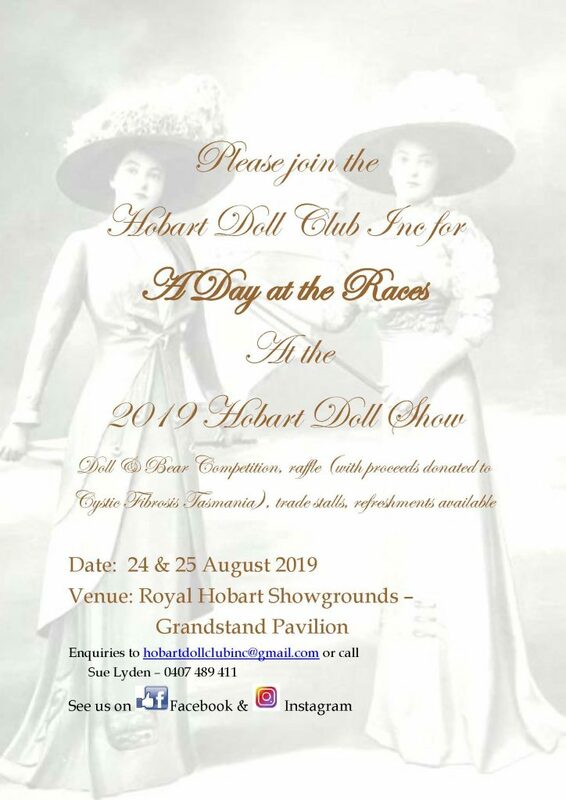 The highlight of the year is in August when we hold the Hobart Doll Show – the largest doll making competition in Australia. At our regular meetings we conduct workshops and have outings and there is usually a great deal of lively discussion about our pastime – some would call it our obsession! As a group our interests range from making antique and modern porcelain dolls to collecting, and restoration & conservation techniques. Not that we limit our interests – many of our members also make teddy bears and cloth dolls and are interested in a wide range of other crafts. When you make a porcelain doll, you make it from the ground up – the porcelain slip is poured into a mould and air dried. At this stage it is called “greenware” and needs tp be handled very carefully. After the greenware is meticulously but gently cleaned to remove seams and other surface imperfections, it is bisque fired in a kiln and now has the qualities of fired porcelain. The porcelain then requires another clean to make sure the surface is silky smooth, then the painting can begin. The eyelashes, eyebrows, eyes, lips, cheeks and so on are all painted over a number of sessions, with one layer being fired in the kiln before painting the next. Once fired, the paint cannot be removed. The bodies could be either porcelain, composition or cloth, depending of the style of the doll. We assemble the doll and then dress it according to the style we have chosen. For example, if we’ve chosen to make an antique reproduction doll, we research the era it comes from and hand make all the garments including wigs, shoes, stockings, underwear, dress, coat, hat and any accessories! Doll making doesn’t just stop at making the doll – many of our members are expert seamstresses, embroiderers, milliners and cobblers as well! But one thing we do all have in common is enthusiasm and the willingness to share our knowledge and skills. New members to the club are always welcome and encouraged. If you have any questions or you wish to find out more about our club, head to our ‘Contacts’ page where you will find contact numbers for some of our members, or alternatively feel free to e-mail us.